In 1968, a CBS executive named Fred Silverman came up with the idea of creating a child-friendly cartoon revolving around four teens, after parental watchdog groups had spoken out about too much violence in cartoons. Initially, Silverman released The Archie Show, a television program based off of the currently popular Archie Comics. Excited about the widespread popularity of the show, Silverman decided to make another show revolving around four teens. After talking with William Hanna and Joseph Barbera, the co-creators of Hanna-Barbera Productions, Silverman decided to use the formula of a teenage rock group for a new show. Being a fan of mystery shows such as I Love a Mystery and The Many Loves of Dobie Gillis, Silverman wanted to take elements from these two shows and have the teenage rock group solve mysteries in between concerts. William Hanna and Joseph Barbera pitched Silverman's idea to their two head story writers, Joe Ruby and Ken Spears. They decided to title the show Mysteries Five, with five teens named Geoff, Mike, Kelly, Linda and her brother W.W., as well as their dog named Too Much. The band named themselves The Mysteries Five because they all shared a strong interest in solving mysteries. Hanna and Barbera also tasked artist Iwao Takamoto with designing the dog, which was currently slated to be a sheepdog. In collaboration with Ruby & Spears, and Hanna & Barbera, the dog's breed was later changed to a Great Dane, to avoid similarity with The Archies, who had a sheepdog. Takamoto also consulted with a dog breeder before designing Too Much, trying to get the dog's features similar to what an actual Great Dane would look like, while also making the decision to give the dog some unique features. A lot of mental labor had been put into the show, and it was finally time to pitch it back to Fred Silverman to see what he thought of the changes. Silverman decided to change Geoff's name to Ronnie, and eliminate Mike's character completely. He presented the show to the CBS network executives under a new title, "Who's S-S-Scared?" as the centerpiece of the 1969-1970 Saturday morning programming block. The networks rejected Silverman's pitch, citing that the show was much too frightening for younger viewers. After the show's rejection, Silverman went back to Ruby and Spears and requested they make the show more comedic. Ruby and Spears made several creative changes to the show, including renaming Ronnie to Fred after Fred Silverman. The rock band element of the show was dropped, and Silverman wanted to incorporate Frank Sinatra's scatting in his song "Strangers in the Night" ("scoo-by-doo-by-doo") into the show somehow. Frank decided to name the dog "Scooby (Dooby) Doo" after Frank Sinatra's hit song, and Scooby-Doo was born. The characters were also renamed to Shaggy, Velma, Daphne shortly thereafter. After Silverman renamed the show one last time to Scooby-Doo, Where Are You?, his pitch was accepted by the CBS network executives, who made the show the centerpiece of the 1969-1970 Saturday morning season. The show aired its first episode, "What a Night for a Knight" on September 13, 1969 at 10:30 a.m. (EST) in the United States. Seventeen episodes were produced for the first season of the show, which concluded January 17, 1970. The show was a huge success, and 65% of US Saturday morning television viewers tuned in to watch the show every Saturday morning according to Neilson Ratings. Due to the popularity, the show was renewed for a second season comprised of eight episodes. Some minor formulaic elements of the show were changed for season 2. Every episode (except "A Tiki Scare is No Fair") had a song recorded which was played during the scene where the monster chases two or more of the gang members. The theme song was also re-recorded, using the same lyrics as the original. The intro was also slightly changed, featuring different scenes and monsters that were present in the second season to replace first season scenes. Scooby-Doo, Where Are You? was cancelled after two seasons and twenty-five episodes on October 31, 1970. 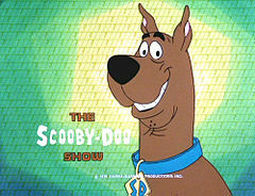 In 1971, reruns of the show were aired for the full season, with no new Scooby-Doo episodes airing during that year. 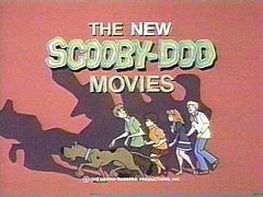 The formula of the show was changed and pitched again in 1972, under the new title The New Scooby-Doo Movies. The show used the same basic underlying formula, though the length of the show was doubled from 22 to 44 minutes, and a famous guest star was added into every episode. The show included both real-life guest stars and fictional guest stars from other popular television programs at the time. The show ran for two seasons and twenty-four episodes, and was cancelled on October 27, 1973. No new Scooby-Doo content would air from that time until 1976. Hanna-Barbera made an executive decision to move Scooby-Doo to ABC in 1976. This show, titled The Scooby-Doo Show, brought the show back to the classic formula that was seen in Scooby-Doo, Where Are You?. The guest star element of the show was dropped, and the show was brought back to the regular 22-minute length. The only difference was that Pat Stevens was cast as the voice of Velma, after Nicole Jaffe stepped down due to her marriage. The show was also noticeably more dark, particularly in season two. The show ran for three seasons and 40 episodes. It was later repackaged several times alongside Dynomutt, Dog Wonder (The Scooby-Doo/Dynomutt Hour) and later as Scooby-Doo, Where Are You? for the third season in 2007, most likely for marketing reasons. The show was cancelled on December 23, 1978. 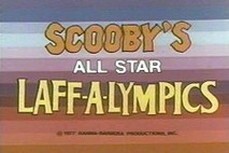 Alongside The Scooby-Doo Show was the Laff-a-Lympics (later renamed Scooby's All Star Laff-A-Lympics for reruns), which featured 45 Hanna-Barbera characters competing against each other in a Battle of the Network Stars-esque show. The competition consisted of three teams, The Scooby Doobies, The Yogi Yahooeys and The Really Rottens. Many of the competitions consisted of the Rottens cheating their way through the events or sabotaging other competitors. Scooby-Doo was the captain of The Scooby Doobies, a team which also included Shaggy and Scooby's cousin Scooby-Dum, who had appeared in four episodes of The Scooby-Doo Show. The events brought the teams to several famous locations around the world. The show lasted for two seasons and twenty-four episodes and was cancelled on October 28, 1978. In 1979, Scooby's rating began to slip and network executives claimed the show's formula was getting old quickly. To help remedy this, a one-hour film was created and aired December 13, 1979. The film broke the fourth wall and had the gang become aware they were actors in a television show. The plot revolves around Shaggy and Scooby temporarily quitting their acting position on the show, believing they are destined for greater fame. Additionally, the network executives decided to create a new main character to add to the show, Scooby's nephew Scrappy-Doo. Scrappy was the polar opposite of Scooby, and wanted to chase and fight monsters instead of running away like his cowardly uncle. 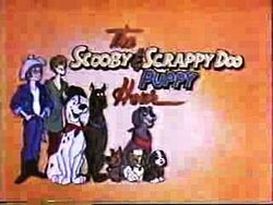 Lennie Weinrib provided the voice of Scrappy, and shortly after the show was renamed The Scooby and Scrappy-Doo Show. The show only lasted for one sixteen-episode season and was cancelled on January 5, 1980. The show also faced production problems in several areas, including Pat Stevens (the voice of Velma) quitting mid-season after 11 episodes, and Lennie Weinrib continuously pushing for an outrageous salary increase. To remedy these problems, Marla Frumkin was given the role of Velma in episodes 12 through 15, and Lennie Weinrib was fired at the end of the season. One experimental episode was also made, "The Ransom of Scooby Chief," which mainly focused on Shaggy, Scrappy and Scooby and barely included the rest of the gang. This was to set things up for a new show, which included Shaggy, Scooby and Scrappy fighting real monsters and bad guys and dropping Fred, Velma and Daphne from the show entirely. 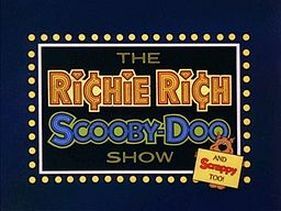 The new redesigned show was titled The Richie Rich / Scooby-Doo Show. The show was comprised of three seven-minute shorts, and was aired alongside three Richie Rich shorts to make an hour-long programming block. 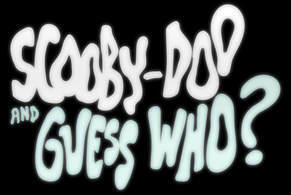 The show lasted two seasons and 60 Scooby-Doo shorts, and was cancelled on October 31, 1981. The Scooby & Scrappy-Doo Puppy Hour was immediately pitched after The Richie Rich/Scooby-Doo Show was cancelled. The show was greenlighted, but a few changes were made. The show now featured Shaggy, Scooby and Scrappy being employed at Shaggy's Uncle Fearless's detective agency and fighting crime. 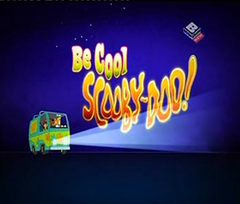 Only two seven-minute shorts focused on Shaggy and Scooby in this series; the third focused solely on Scrappy along with his other uncle Yabba-Doo and Deputy Dusty. The show began airing on September 18, 1982 and was cancelled exactly three months later on December 18, 1982, after only one season and 39 shorts. The show was also paired alongside The Puppy's New Adventures to make another hour-long programming block. The executives at ABC decided to redo the formula once again, and reintroduced Daphne to the show while leaving Fred and Velma still absent. The real monster aspect of the previous two series was also utilized, while craftily working the classic person-in-a-mask formula back into the new series. 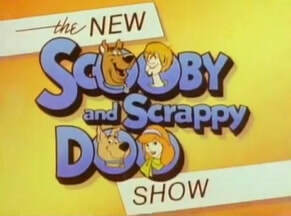 The show was titled The New Scooby and Scrappy-Doo Show and changed from 7-minute shorts to 11-minute shorts. The last two episodes, however, were the regular 22-minute length, though they are sometimes referred to as two-part episodes due to the inconsistency with the rest of the show. Twenty-four episodes aired (counting each short separately) in the first season, after which the show was cancelled for another adaptation. The show lasted exactly three months, and was cancelled on December 10, 1983. The New Scooby-Doo Mysteries utilized virtually the same formula as the previous show. The only differences were there were a mix of 11-minute shorts and 22-minute episodes throughout the series. Fred and Velma returned as semi-regular characters in the 22-minute episodes, sometimes appearing together and occasionally appearing separately. Twenty episodes were produced, and the show lasted only a single season before being cancelled on December 1, 1984. In 1985, the show was given another major overhaul. Fred and Velma were once again absent from the show completely, and two new characters were introduced in their place. One of these characters was Vincent Van Ghoul, a parody of Vincent Price, who voiced the character. Vincent is a mystic warlock who assists the gang on their journey. Another character, Flim Flam, was also added because the network felt they needed a younger character for children to relate with. The episodes were once again consistently 22 minutes in length. The show provided the first overarching story arc and provided a much darker approach to the franchise. 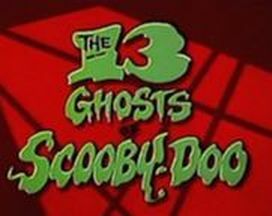 The show focused around Shaggy and Scooby being tricked into opening The Chest of Demons, an evil demon chest that housed "thirteen of the most terrifying ghosts on the face of the Earth." The series also featured Tom Ruegger (who previously wrote a few episodes in 1983 and 1984) added onto the show as a head writer. Ruegger provided a fresh take on the series, adding some comedy and recurring gags into the show to complement the darker tone. The series only lasted one thirteen-episode season and three months. The show was cancelled on December 7, 1985, before the story arc was able to complete. 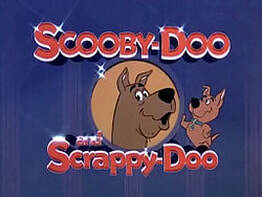 Three final films with Scrappy-Doo were also produced in 1987 and 1988, which featured Shaggy, Scooby and Scrappy solving mysteries with real monsters. Fred, Velma and Daphne were once again absent. Scrappy's character was also noticeably toned down from his previous appearances. These films served as the final animated appearance of Scrappy to date, beyond brief non-speaking cameos. In 1988, the show was brought back to the classic formula of the original five gang members. Scrappy-Doo was removed from the show completely. With Ruegger heading the writing room again, he decided to create a prequel series which highlighted the gang's mystery-solving life as children. The series had a much more zany tone, which Fred's character being changed to have a much more dimwitted personality, and Daphne becoming more bossy. The series also featured several recurring gags, including Fred believing the neighborhood bully Red Herring was responsible for every mystery, among many other comedically-focused formulaic elements. The series lasted for three seasons and thirty episodes before being cancelled in 1991. 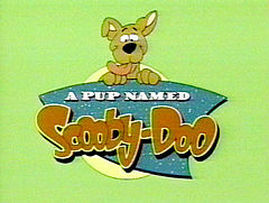 After A Pup Named Scooby-Doo was cancelled, no new Scooby-Doo series aired from 1991 until 2002. One Hanna-Barbera crossover film with Yogi Bear and Magilla Gorilla, entitled Scooby-Doo in: Arabian Nights was released and aired on TBS in 1994. 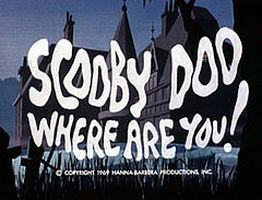 In 1998, the series was revived after a seven-year dry spell with the direct-to-video feature Scooby-Doo on Zombie Island. The film was much more frightening than previous incarnations of the franchise, utilizing real monsters and a very dark plot line and setting. Scooby-Doo and the Witch's Ghost came out shortly afterwards in 1999, which featured the gang going to Oakhaven with famous horror writer Ben Ravencroft. This film also introduced the recurring characters The Hex Girls, an eco-goth band which would later appear in numerous Scooby-Doo films and series from time to time. Scooby-Doo and the Alien Invaders and Scooby-Doo and the Cyber Chase were released in 2000 and 2001 respectively. This indirectly led to the series being reimagined in 2002. What's New, Scooby-Doo? would be pitched in early 2002, as an updated version of the original series prominently featuring updated technology and settings. What's New, Scooby-Doo? lasted for three seasons and forty-two episodes, before being cancelled in 2005. The final first-run episode "E-Scream," however, was inexplicably held back until 2006, marking the end of the series. 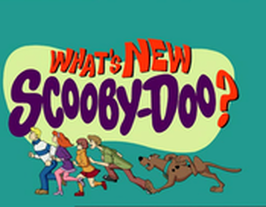 Several DTVs (including two "throwback" films, Scooby-Doo and the Legend of the Vampire and Scooby-Doo and the Monster of Mexico) were based off of the What's New, Scooby-Doo? model, and at least one new DTV was produced every single year beginning in 2003, a tradition which continues to this date. The series also featured several new voice actors, Mindy Cohn as Velma, Grey DeLisle as Daphne and Frank Welker picking up the role of Scooby from a vacancy left by his previous voice actor Don Messick's death. The series aired on the Kids' WB programming block on CW. There were also the two-live action films, which were released in 2002 and 2004 respectively. The films were written by Raja Gosnell and James Gunn. Scrappy-Doo made an appearance in the first film, due to Gunn's hatred of Scrappy and his desire to sabotage the character that he felt "ruined" the original show when he was growing up. Matthew Lillard (Shaggy), Linda Cardellini (Velma), Freddie Prinze Jr. (Fred), and Sarah Michelle Gellar (Daphne) were cast as the gang members in the films. Neil Fanning provided the voice of Scooby. In 2006, Shaggy & Scooby-Doo Get A Clue! majorly revamped the series again. 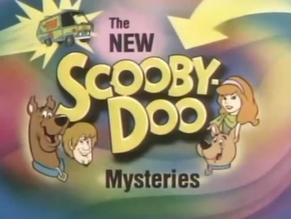 The series solely focuses on Shaggy and Scooby, writing Fred, Velma and Daphne out of the show once more besides a few brief cameos throughout the series. The series also features an overarching plotline, involving Shaggy and Scooby taking a break from solving mysteries to find Shaggy's rich Uncle Albert, who has mysteriously disappeared and left Shaggy his mansion and all his money. They quickly discover Uncle Albert is in hiding from the nefarious Dr. Phibes, a super villain determined to take over the world. This series additionally featured a brand new art style, drastically deviating from the previous animation of the series. Shaggy and Scooby-Doo Get A Clue! aired for two seasons and 26 episodes, before it was cancelled on March 15, 2008. Shaggy's voice actor was also changed for this series only. Kasem temporarily stepped down from his role and it was given to Scott Menville, who had previously voiced the recurring character Red Herring on A Pup Named Scooby-Doo. In 2009, the next show Scooby-Doo! Mystery Incorporated was greenlighted, as well as a special prequel film, Scooby-Doo! The Mystery Begins. The film aired on the fortieth anniversary of the original series premiere in 1969, and revolved around the gang meeting each other for the first time in high school. The film was incredibly successful, and a sequel (Scooby-Doo! Curse of the Lake Monster) was released in 2010. The films featured Nick Palatas as Shaggy, Robbie Amell as Fred, Kate Melton as Daphne and Hayley Kiyoko as Velma. Scooby-Doo! Mystery Incorporated premiered on April 5, 2010 in the United States. 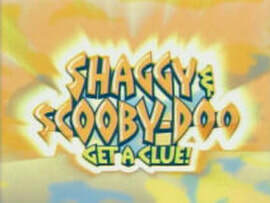 While the show was much closer to the show's mystery-solving roots than its predecessor, a new element was also added. Each episode featured the mystery-of-the-week as per normal, in addition to an overarching mystery which was slowly solved throughout the course of the series. The series was also very similar to a soap opera, with many of the plots revolving around romantic relationships between the characters. The series presents a much more mature take on the classic formula, with darker plots and implied character deaths. 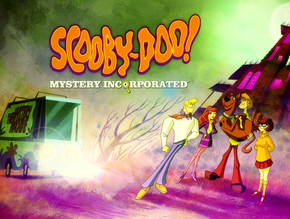 The series also has several references and nods to previous Scooby-Doo incarnations, though canonically it exists in a separate universe from all other series and films. The series ran for two seasons and fifty-two episodes on Cartoon Network, before it was cancelled exactly three years from its premiere date on April 5, 2013. After Scooby-Doo! Mystery Incorporated was cancelled, WB began experimenting with different directions that the franchise had not yet taken. In 2013, a puppet movie (which unofficially parodied A Pup Named Scooby-Doo) was released, and beginning in 2015, several films and shorts were released in LEGO animation to promote the new Scooby-Doo LEGO sets which were released August 1, 2015. Several DTVs with celebrity crossovers similar to that of The New Scooby-Doo Movies were released, featuring television and music personalities such as the WWE Superstars, KISS, and Celebrity Chefs. Six special episodes not a part of any series were also released on various DVDs from 2012 to 2015. Taking inspiration from the hit show Phineas & Ferb, WB brought the two of the talents from the show, Jon Colton Barry (a writer) and Zac Moncrief (one of the directors and storyboard writers), to help write a new Scooby-Doo show. Jon Colton Barry was named the head writer of the new show, titled Be Cool, Scooby-Doo!, and Moncrief was hired as one of the show's producers. Originally, executives at WB provided Barry and Moncrief with the premise of the gang trying to spend one last summer solving mysteries before college. However, the duo found it too restrictive and ultimately ended up scrapping the idea. Barry came up with idea for the series to focus around friendship and fully develop the gang's personalities, writing many of the episodes around this underlying premise. He also did research and took some inspiration conversing with Scooby-Doo fans on the ScoobyAddicts forum as he was working on the final scripts. The series also featured a new animation style, which complemented the comedic and whimsical tone of the show. For the first time since A Pup Named Scooby-Doo, Fred was written as an intelligent character that has some minor control issues regarding his unofficial leadership position in the gang. Daphne was additionally written differently than how previously series portrayed her. In the show, Daphne is represented as a very quirky individual who is usually very cheerful and often provides moral support to the gang during the process of solving a mystery. The show premiered on October 5, 2015 on Cartoon Network in the United States, but eventually ended up leaving the network after the premiere of "Giant Problems" on March 12, 2016. On June 20, 2016, the series switched to Cartoon Network's sister channel Boomerang, where the final six episodes of season one were aired in an overnight slot. The series was placed on a year-and-a-half hiatus after season one ended, though season 2 began in most countries in May 2017. Season 2 ended on November 13, 2017 in the United Kingdom. By this time, WB had let Jon Colton Barry go after scriptwriting was complete, making the somewhat unorthodox decision to finish up production without any writers on staff. Zac Moncrief had also left earlier in the second season due to production issues. This effectively cancelled the series, as no new episodes were ordered by the network. In order to promote Boomerang's new streaming service, the first fifteen episodes of season 2 were added exclusively to the streaming service on December 21 and 22, 2017. Inexplicably, Boomerang aired the final eleven episodes of the series in an another overnight slot on March 8-18, 2018 despite previous announcements that all season 2 episodes would air on the streaming service. The series lasted 52 episodes and two seasons. Two months after Be Cool, Scooby-Doo! era, a fifth live-action film was pitched by the Tisdale sisters, who own Blondie Girl Productions. The film, titled Daphne & Velma, provided an origin story for the two female members of Mystery Incorporated. Disney actresses Sarah Gilman and Sarah Jeffery were cast as Velma and Daphne. The film provided a message of positivity, self-acceptance and female empowerment, while also touching upon social issues such as overdependence on technology. The film was released on May 22, 2018. Having success with previous DTV crossover films, WB decided to unofficially reboot The New Scooby-Doo Movies in 2018, featuring more contemporary guest stars. The series was announced on May 23, 2018 and is currently titled Scooby-Doo and Guess Who? Guest stars currently slated to appear in the show include Halsey, Sia, Mark Hamill, Chris Paul, Neil deGrasse Tyson, Ricky Gervais, Kenan Thompson, and Bill Nye, The Science Guy. Fictional guest stars include Batman (voiced by Kevin Conroy), Steve Urkel (voiced by Jaleel White), Wonder Woman, The Flash and Sherlock Holmes. Recording artist Halsey also confirmed she was guest-starring in the series, two days before the official series announcement in a Billboard interview. In early June, the first storyboard animatic was released on Vimeo publicly. The series is planned for a 2019 release on the Boomerang streaming service in the United States. As of currently, two seasons have been announced.